Buda (pronounced BYU-de) is located just 17 miles south of downtown Austin in Hays County. The history of the name has several possibilities, the most probable of which is that the name comes from the Spanish word for ‘widow’, i.e. viuda, and was inspired by a widow who operated a hotel in the early days of the settlement. Today, Buda is a relaxing, friendly town and a great place to live, work, and visit. Folks in Buda enjoy the advantages of nearby Austin, being only minutes from downtown Austin, while celebrating the tranquility and high quality of life of a small hometown. 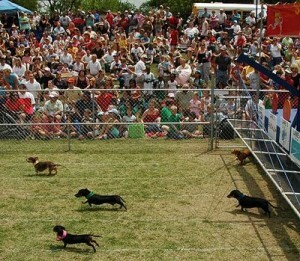 Buda is home of the world famous Wiener Dog Races! The City was formally established on April 1, 1881, when Cornelia Trimble donated land for a town site at an International-Great Northern Railroad depot there. Phillip J. Allen had settled the area, originally part of the Mexican land grant to Stephen B. von Eggleston, as early as 1846. In 1929 its population was estimated at 600, but by 1933 it fell to 300. Only in the mid-1980s, as the growth of Austin began to be felt in Buda, did its population once again approach pre-depression levels. The town was incorporated in 1948, and in 1967 Buda, Kyle, and Wimberley formed the Hays Consolidated Independent School District (only Buda and Kyle remained in the district after 1986). By the mid 1980s Buda had attracted a cement plant and some craft industry, but the community was still primarily rural and residential. Perhaps the largest boon to local business has been the locating of Cabela’s, the famous camping and outdoor life outfitter in Buda. The town is also the home of Jardine Foods. Located next to the Old Stagecoach Property on North Loop 4, Jardine Foods is one of the premier specialty food makers in the State of Texas.